The need for culturally relevant treatment interventions for refugees focusing on post-migration factors is clearly of no small concern. To (i) explore culturally informed perspectives on trauma from an individual, qualitative perspective and (ii) track the trajectory of post-traumatic responses in relation to processes of social integration, we present the results of 12 months of research among asylum seekers and refugees in an NGO-run centre for victims of torture in Athens, Greece. This included an in-depth follow-up of 10 victims of torture, as well as interviews with 36 health professionals, seven cultural mediators and 21 refugee community leaders. A case study from the research project is presented to illustrate the substantial psychological impact of current material realities of refugee victims of torture as they adapt to their new environment. An interpersonal-social model is presented which examines various post-migration ‘feedback loops’ influencing post-traumatic symptomatology. The mental health impact of atrocities endured by refugees and asylum seekers is clear, with significantly high prevalence rates of post-traumatic stress disorder (PTSD), anxiety and depression being reported among this population. Torture has emerged as a particular triggering factor for PTSD (Haenel, 2015; Momartin, Silove, Manicavasagar, & Steel, 2003; Steel et al., 2011). However, there have been numerous concerns raised in the literature over the relevance and cross-cultural validity of current treatment models for PTSD being used among refugee populations. Criticisms highlight the fact that the medicalisation of trauma on an individual level, linked to fixed ‘traumatic’ events in the past, risks rendering us blind to other ongoing aspects of interpersonal, political and social violence on a more global scale. Various studies have demonstrated the detrimental impact on mental health of the migration journey, including prolonged detention or stays in often unsafe refugee camps (Gkionakis, 2016; Lambert & Alhassoon, 2015; Silove, Austin, & Steel, 2007) as well as the asylum-seeking process (d’Halluin, 2009; Laban, Gernaat, Komproe, Schreuders, & De Jong, 2004). Post-migration factors, such as unemployment, an insecure residency status and fear of repatriation, insufficient proficiency in a host language, social discrimination and difficulties with integration have similarly been shown to be correlated with mental problems in refugees (Kartal & Kiropoulos, 2016; Schick et al., 2016; Sijbrandij et al., 2017; Silove, Ventevogel, & Rees, 2017). The psychological impact of these factors and other ‘daily stresses’ (Miller & Rasmussen, 2014) are a relevant consideration in the light of the additional critical life events with which asylum seekers and refugees are faced. In a multi-agency guide on the mental health of refugee populations released in 2015, agencies and other international humanitarian organisations have highlighted that potentially traumatic events from the past are not the only, or even most important, source of psychological distress but that the majority of emotional suffering is directly related to current stress factors (Crepet et al., 2017; Inter-Agency Standing Committee (IASC), 2015; Médecins Sans Frontières (MSF), 2016; Ventevogel, Schinina, Strang, Gagliato, & Hansen, 2015). Several studies on refugees and asylum seekers have confirmed this clinical impression (Maier & Straub, 2011; Silove, 1999; Silove, Steel, McGorry, & Mohan, 1998; Van Ommeren et al., 2001). Furthermore, treatment models developed in Western cultural contexts have been criticised for ignoring significant variability among explanatory models of distress evident in different cultural settings (Hinton & Lewis-Fernández, 2011; Steel et al., 2009). Often, the relationship between the health professionals and asylum seeker or refugee face cultural barriers regarding a lack of shared understanding, explanatory model or idiom of distress, rendering exchanges in the consultation difficult and increasing the risk of incomprehension and errors in diagnosis and . This itself is a barrier to access. From a public health perspective, the need for culturally relevant treatment interventions considering post-migration factors is clearly of no small concern. A plethora of key authors in the field as well as humanitarian actors have highlighted this gap in the literature and call for more longitudinal studies to add to our understanding of trauma from a more culturally, socially and politically relevant perspective. This includes a focus on life trajectories, dynamic processes and current material realities for refugees in host communities (Bäärnhielm, 2016; Eagle, 2014; Greene et al., 2017; Hall & Olff, 2016; Harvey, 2007; Ratcliff & Rossi, 2015; Summerfield, 1996, 2001; Wilson, Wilson, & Drozdek, 2004). Given these numerous criticisms surrounding the use of PTSD among refugee populations, we draw on the theoretical framework of cultural-historical psychology to examine trauma among this population (Womersley & Kloetzer, 2018). Based on Vygotskian principles of interactive individual–societal development via the creation of meaning in everyday (Daiute & Lucić, 2010), such a framework explores how psychological phenomena are historically rooted and shaped by the socio-cultural context. This framework, therefore, advocates for a move away from the essentialist and context-independent notions of PTSD towards viewing experiences of trauma as being embedded within socio-cultural contexts and intrinsically interwoven with them (Stetsenko & Arievitch, 2004). This theoretical tradition differs from transcultural or ethnopsychiatric frameworks often characterised by cross-cultural comparisons. Instead, within this tradition, culture is considered to be ‘not a fixed, static entity but the result of creative activity, in which ideas and notions are developed and shared’ (Tankink & Richters, 2007, p. 198). It ‘is not presumed to exist in values or beliefs of ethnicity, gender, or other categories but in the creation of meaning through symbolic thought in situations on the ground’ (Daiute & Lucić, 2010, p. 616). In recent years, there has indeed been a burgeoning of theoretical models for understanding trauma that situates individual refugee’s trauma sequelae and recovery within inter-personal, political and social context. Maercker and colleagues (Maercker & Hecker, 2016; Maercker & Horn, 2013) have recently elaborated and extended a social-interpersonal framework model of PTSD incorporating a host of influential factors external to the individual. Harvey’s (2007) ‘ecological’ model, Drozdek’s (2015) model, Marsella’s (2010) interactive model, and De Jong’s (2007) ecological-cultural-historical model of ‘traumascape’, similarly explore how culture influences the clinical parameters of the diagnostic criteria for PTSD by incorporating a systemic understanding of local representations and experiences of trauma. Such perspectives take into account the fact that symptom severity is fluid, ever changing due to a myriad of interacting intrapsychic and external factors. In the context of refugee distress in particular, Miller and Rasmussen’s (2017) ecological model highlights how ‘mental health among refugees and asylum seekers stems not only from prior war exposure, but also from a host of ongoing stressors in their social ecology, or displacement-related stressors’ (p. 1). Using these ecological models to (i) explore culturally informed perspectives on trauma from an individual, qualitative perspective and (ii) track the trajectory of symptomatic responses in relation to the processes of social integration, we conducted 12 months of research among asylum seekers and refugees in an NGO-run centre for victims of torture in Athens, Greece. This longitudinal study involved participant observation as well as qualitative, in-depth interviews with 76 various actors. The study protocol was developed in collaboration with the multidisciplinary team of the centre for the victims of torture in Athens, Greece. Ten victims of torture attending the clinic were identified by the medical team to participate in the research. Exclusion criteria included current psychotic symptoms, severe dissociative symptoms and acute suicidality. The average age was 39.5, and we conducted an average of 5.2 interviews with each of them over the period of a year. Interviews were focused on tracking trauma symptomatology, subjective experiences and explanatory models of trauma, as well as exploring the current socio-political environment and processes of integration into Greek society. Three months of participant observation was similarly conducted within the centre, which included attending daily team meetings and participating in group psychosocial activities. To further contextualise our understanding of trauma within this particular environment, we also conducted interviews with 36 health professionals working with refugee victims of torture from a variety of humanitarian organisations and seven cultural mediators working in psychosocial interventions for individuals diagnosed with PTSD. Furthermore, we conducted qualitative, in-depth interviews with 21 community representatives to explore socio-culturally contextualised understandings of, perspectives on and explanatory models for psychological trauma within their respective communities. Individual victims of torture’s experiences of trauma were analysed based on the ecological models noted above (De Jong, 2007; Drožđek, 2015; Maercker & Hecker, 2016; Miller & Rasmussen, 2017). This involved firstly defining the migration trajectory of each individual by drawing on Kadianaki (2009) method of analysis of migration trajectories, wherein certain bifurcation points are identified: defined as important events or conditions in the lives of the individuals. In a second level of analysis, we analysed all instances, whereby participants referred to experiences of trauma, to identify and compare the various explanatory models drawn upon by different actors. Data obtained by health professionals related to specific individuals was triangulated. Key themes emerging included the substantial psychological impact of current material realities for migrant victims of torture as they adapt to their new environment and engage in a process of psychosocial rehabilitation. The periods before and after being granted asylum were identified as two distinct phases in the psychological lives of these individuals, each with specific stressors. Delayed asylum trials, poor living conditions and unemployment emerged as having a substantial impact on post-traumatic symptoms that in turn influenced psychosocial rehabilitation. Personal, social and cultural resources similarly emerged as having a mediating effect on the stressors identified above. Half of the beneficiaries of the centre, where our research was conducted, had never heard of a psychologist before. None had been previously to a psychologist themselves. Of the ten individual participants, all were diagnosed with some form of psychological disorder. However, over the course of a year, not one mentioned the diagnosis when referring to their subjective experiences of psychological suffering. Rather, the majority appeared to contest this medicalised explanatory model, drawing instead upon a variety of diverse culturally informed explanatory models to explain their subjective experiences of trauma. For instance, when asked about his diagnosis of PTSD, one participant explained that ‘my family’s problem is shock’. For him, the trauma he experienced was not only his but was also related to the ‘shock’ of the entire family. This contradicts the inherently individual narrative of PTSD. This was similarly reflected in the words another participant, who felt ‘the pain of my families’. This more collectivist representation of trauma has similarly been noted in the literature, illustrated in the example presented by Tankink and Richters (2007) of South-Sudanese research participants who did not experience themselves so much as an individual, but more as having a ‘family self’ based on relational models. Such explanatory models often appeared in contradiction to the medical team’s individualised model of PTSD. Elsewhere (Womersley & Kloetzer, 2018), we have highlighted how the majority of professional’s discourse reflected a certain ambivalence in the face of such contradictions. Attitudes among the health professionals appeared to range on a continuum from complete and unproblematic acceptance of the category of PTSD, to a nuanced, individualised and context dependant use, through to a critiquing and problematisation of the diagnosis. An illustrative case study allows us to examine these contradictions in explanatory models of trauma and the importance of the socio-legal environment in the processes of recovery. Many cultural factors, such as a specific socio-political identity, were evidently at play for this particular individual. Furthermore, the case clearly highlights the impact of particular legal and medical institutional pathways on psychosocial recovery. It further offers the possibility of triangulating the data obtained from this individual participant, his doctor and psychologist. is a 30-year-old Indian asylum seeker of Sikh religion. In 2007, he was arrested and tortured on numerous occasions, often for months at a time, due to his involvement as a Sikh political activist. He managed to escape from prison with the help of an uncle and arrived alone in Athens to seek asylum in September 2015. He was referred to the centre for victims of torture in June 2016, where his treating doctor describes ‘a clear case of post-traumatic stress disorder’, including symptoms of flashbacks and nightmares, at the first consultation. ‘My father’s, my father family and my mom’s family − they are very, very connected with their religion […] from my mom’s family, I have seen a lot of dead bodies. They were innocent and they were killed by the Indian government police and the secret services, because of that, because we were fighting for our freedom’. ‘From the front, they were giving the electric shocks. They never give the scars on my body but they give me the scars on my personality. They give me the scars on my soul … lots of things from my mind has been wasted’. P: ‘Mr. Psychologist doctor, he gave me the report. In that report, he has written that I’m in very big depression. Actually, I don’t know if I’m in depression or not. I know only one thing, that my world is just only this room … I’m just killing my time here until I’m not getting my papers or they are not going to take my interview […]’. Interviewer: ‘Tell me about the psychiatrist you said that you’re going to be seeing later’. P: ‘No, it’s not [our emphasis]. What he is going to do, I don’t think he’s going to help me in any way. The things that happened to me, what he wants to do, he’s just speaking, and speaking, and speaking, and talking about things, nothing much … Why I am coming to the people here, to see the psychiatrist and the doctor, because then they will know that I’m also here. There are thousands and millions of refugees here. If were to come in here, I will be in front of their face, and they will be knowing about me’. The contradictions between the patient’s own explanatory model, and that of the psychiatrist, are striking. He reported not finding the consultations with the psychiatrist helpful, seeing little use in being required to ‘talk about things’. Not only did he not agree with the PTSD diagnosis, he mistook it for a diagnosis of depression. There seemed to be little correlation between the words of the psychiatrist and the ‘scars of [his] soul’. Despite continually being haunted by ‘dark dreams’, his focus was on being ‘seen’ as a refugee. Never having heard of a psychologist or psychiatrist before, he saw psychotherapy as a useful way to obtain this legal goal. So what is ‘paranoia’ and what is ‘real life?’ To analyse the data, we draw on the concept of feedback or ‘looping effects’ (Kirmayer & Ramstead, 2017), by the authors as links in a causal chain ‘whereby individuals interpret and respond to their own symptoms with culturally varied coping strategies that may change the course of the illness, amplifying or reducing symptoms and distress’ (p. 6). They argue that such socio-cultural feedback amplification extends beyond the individual to include a wider network of relationships and processes wherein the individual is embedded. We posit that such a series of ‘feedback loops’ (which we define as a process whereby an effect is reinforced by its own influence on the process giving rise to it) impacted post-traumatic symptoms as well as the patient’s self-representation of his own mental health status. A number of feedback loops may be identified on an individual, interpersonal and social level, as illustrated by our model [Figure 1]. The experience of being tortured is arguably a traumatic experience in and of itself. However, added to this is the fact that the patient is not the only member of his family to have been tortured. His father’s presumed death and mother’s alleged detainment and torture alludes to a traumatic experience extending far beyond that of the individual. Indeed, the torture of his family and subsequent forced migration, which he undertook alone, created traumatic ruptures in his interpersonal relationships and by extension, his broader social world. Paradoxically, such connections would have connected him to the very resources necessary to heal. These are both resources found on an interpersonal level in disclosure and sharing emotional experiences, and on a social level within secure group membership. Thus, a vicious cycle of isolation and disconnection is perpetuated, seemingly serving to exacerbate his fear. Furthermore, the disconnection cannot be considered as a ‘once-off’ event, which occurred at a particular moment in the past: ruptures continue with each phone call bringing news from India. A long asylum procedure has been found in the literature to be associated with psychiatric disorders (Laban et al., 2004). For the patient, his insecure residency status increased uncertainty regarding his future as well as his ability to integrate, look for work and create a life for himself. Waiting for his asylum interview, his fear was compounded by being in an irregular legal situation and the risk of being forced out of the country. This fear kept him from leaving his house and integrating into his new social environment. On an interpersonal level, this reduced opportunities for exchanges. On a social level, the delay arguably contributed to further disconnections in visibility, representation and the acknowledgement of the torture, which he had endured within broader, societal and political contexts, which were intricately linked to restorative justice perceptions contributing to the severity and course of PTSD (Maercker & Hecker, 2016). The loop returns to the level of individual, in the patients’ questioning of his own social, cultural and political identity. The delayed asylum procedure prevented the patient from having the right to look for work and find an apartment on his own. Without more financial, legal or social resources and, thus, still dependant on state services as an asylum seeker, he was moved from his own hotel room to new accommodation. Sharing with Pakistanis whom he did not trust, his interpersonal resources were further compromised and his social world further limited by not being able to find work. Such conditions seem to have exacerbated the post-traumatic symptoms, with auditory hallucinations telling him that he would be homeless leading to his hospitalisation. Such discrepancies between his own explanatory model for his symptoms and that of others around him had an impact on his interpersonal relationships. They seemed only to reinforce his solitude. Here, it is worth returning once more to his stated reason for attending consultations with the psychologist and psychiatrist as highlighted above. It is not because he seems himself as a patient. It is for visibility and recognition. It is so that ‘they will know that I am also here’. In operationalising Kirmayer and Ramsted’s concept of ‘feedback loops’ to analyse the case of the patient, feedback loops may be identified across a number of systems: interpersonal, bureaucratic, medical and material (related to concrete living conditions). All the ten victims of torture participating in the study experienced interpersonal disruptions through the experience of migration, had to apply for asylum, were patients at the clinic receiving psychological and medical treatment, and experienced poor living conditions. However, not all of these resulted in such feedback loops defined by their capacity to ‘exert powerful influences on the causes, course and outcomes of distress’ (Kirmayer & Ramstead, 2017). We analysed the ten cases of our research exploring feedback loops across the four systems identified above, and identified them when the subjects themselves, or the staff members, explicitly linked some life event to the mental health evolution of the refugees. A brief summary of this analysis is presented in [Table 1]. Feedback loops were evident across all cases. However, not all experienced multiple feedback loops. The patient seems to be both representative of our sample (in the effect of feedback loops on mental health) and an extreme case (in the multiplicity of feedback loops, across all four fields). Trauma begets trauma. It creates ruptures at the intersection of the individual and their social context. Exposure to trauma, itself connected to a breakdown in social connection and exacerbated by the process of migration, risks the individual being caught up in a vicious cycle, where interpersonal or social resources may be comprised, the very resources necessary for the event itself to be collectively represented and made sense of. For many migrants, torn from the fabric of their collective socio-cultural and political identities, what is potentially compromised is the ability to draw on meaningful interpersonal and social resources to make sense of these events. The multiple traumatic experiences throughout the migratory journey echo exclusion experiences, and the difficulties and uncertainties are related to administrative . In addition, the asylum procedure itself imposes specific, complex institutional pathways, which need to be navigated. This is particularly so in the case of victims of torture with specific mental health and medical needs. 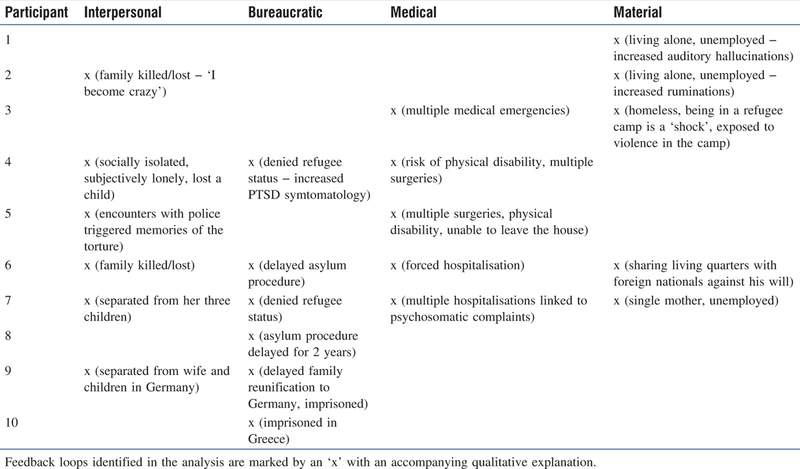 As illustrated by the case of the patient, post-migration factors encountered in Europe, including delayed asylum trials and poor living conditions, had a substantial impact on post-traumatic symptoms among refugee victims of torture in the study. These symptoms were never static but in a continual state of flux, in dynamic interaction with the socio-cultural environment. Psychosocial interventions need to incorporate contextualised understanding of these interactions and to recognise trauma as being largely determined by larger cultural systems and socio-political contexts. The authors would like to thank the participants including the team of professionals at the centre, where the research took place. This research was made possible in part thanks to the generous funding of the Fonds des Donations and the Subvention Egalité of the University of Neuchatel. Bäärnhielm S. (2016). Refugees’ mental health − A call for a public health approach with focus on resilience and cultural sensitivity. European Journal of Public Health, 26(3), 375-376. Crepet A., Rita F., Reid A., Van den Boogaard W., Deiana P., Quaranta G., Di Carlo S. (2017). Mental health and trauma in asylum seekers landing in Sicily in 2015: A descriptive study of neglected invisible wounds. Conflict and Health, 11(1), 1. doi:10.1186/s13031-017-0103-3. d’Halluin E (2009). La santé mentale des demandeurs d’asile. Hommes et migrations, (1282), 66-75. De Jong J. (2007) Traumascape: An ecological-cultural-historical model for extreme stress. In D. Bhugra, K. S. Bhui (Eds.) Textbook of cultural psychiatry (pp. 347-363). Cambridge: Cambridge University Press. Drožđek B. (2015). Challenges in treatment of posttraumatic stress disorder in refugees: Towards integration of evidence-based treatments with contextual and culture-sensitive perspectives. European Journal of Psychotraumatology, 6. doi:10.3402/ejpt.v6.24750. Eagle G. (2014). From evolution to discourse: Key conceptual debates in the history and study of traumatic stress. Psychology in Society (47), 1-20. Gkionakis N. (2016). The refugee crisis in Greece: Training border security, police, volunteers and aid workers in psychological first aid. Intervention, 14 (1), 73-79. Haenel F. (2015) Special problems in the assessment of psychological sequelae of torture and incarceration. In M. Schouler-Ocak (Ed. ), Trauma and migration. Cham: Springer. Harvey M. R. (2007). Towards an ecological understanding of resilience in trauma survivors: Implications for theory, research, and practice. Journal of Aggression, Maltreatment & Trauma, 14 (1-2), 9-32. Hinton D. E., Lewis-Fernández R. (2011). The cross-cultural validity of posttraumatic stress disorder: Implications for DSM-5. Depression and Anxiety, 28 (9), 783-801. Inter-Agency Standing Committee (IASC). (2015). IASC guidelines on mental health and psychosocial support in emergency settings. Geneva: Inter-Agency Standing Committee. Kadianaki I. (2009). Dramatic life courses: Migrants in the making. In Dynamic process methodology in the social and developmental sciences (pp. 477-492). US: Springer. Kartal D., Kiropoulos L. (2016). Effects of acculturative stress on PTSD, depressive, and anxiety symptoms among refugees resettled in Australia and Austria. European Journal of Psychotraumatology, 7 (1), 28711. Kirmayer L. J., Ramstead M. J. (2017). Embodiment and enactment in cultural psychiatry. In Embodiment, enaction, and culture: Investigating the constitution of the shared world (pp. 397). Laban C. J., Gernaat H. B., Komproe I. H., Schreuders B. A., De Jong J. T. (2004). Impact of a long asylum procedure on the prevalence of psychiatric disorders in Iraqi asylum seekers in The Netherlands. The Journal of Nervous and Mental Disease, 192 (12), 843-851. Lambert J. E., Alhassoon O. M. (2015). Trauma-focused therapy for refugees: Meta-analytic findings. Journal of Counseling Psychology, 62 (1), 28-37. Maercker A., Horn A. B. (2013). A socio-interpersonal perspective on PTSD: The case for environments and interpersonal processes. Clinical Psychology & Psychotherapy, 20 (6), 465-481. Maier T., Straub M. (2011). “My head is like a bag full of rubbish”: Concepts of illness and treatment expectations in traumatized migrants. Qualitative Health Research, 21(2), 233-248. Miller K., Rasmussen A. (2017). The mental health of civilians displaced by armed conflict: An ecological model of refugee distress. Epidemiology and Psychiatric Sciences, 26 (2), 129-138. Miller K. E., Rasmussen A. (2014). War experiences, daily stressors and mental health five years on: Elaborations and future directions. Intervention, 12 (4), 33-42. Momartin S., Silove D., Manicavasagar V., Steel Z. (2003). Dimensions of trauma associated with posttraumatic stress disorder (PTSD) caseness, severity and functional impairment: A study of Bosnian refugees resettled in Australia. Social Science & Medicine, 57 (5), 775-781. Médecins Sans Frontières (MSF). (2016). Obstacle course to Europe: A policy-made humanitarian crisis at EU borders. Geneva: Médecins Sans Frontières. Ratcliff B. G., Rossi I. (2015). Santé mentale et sociétés plurielles. Alterstice-Revue Internationale de la Recherche Interculturelle, 4(2), 3-12. Sijbrandij M., Acarturk C., Bird M., Bryant R. A., Burchert S., Carswell K., Cuijpers P. (2017). Strengthening mental health care systems for Syrian refugees in Europe and the Middle East: Integrating scalable psychological interventions in eight countries. European Journal of Psychotraumatology, 8(Suppl. 2), 1388102. Silove D. (1999). The psychosocial effects of torture, mass human rights violations, and refugee trauma: Toward an integrated conceptual framework. The Journal of Nervous and Mental Disease, 187 (4), 200-207. Silove D., Austin P., Steel Z. (2007). No refuge from terror: The impact of detention on the mental health of trauma-affected refugees seeking asylum in Australia. Transcultural Psychiatry, 44 (3), 359-393. Silove D., Steel Z., McGorry P., Mohan P. (1998). Trauma exposure, postmigration stressors, and symptoms of anxiety, depression and post-traumatic stress in Tamil asylum-seekers: Comparison with refugees and immigrants. Acta Psychiatrica Scandinavica, 97 (3), 175-181. Silove D., Ventevogel P., Rees S. (2017). The contemporary refugee crisis: An overview of mental health challenges. World Psychiatry, 16 (2), 130-139. Steel Z., Chey T., Silove D., Marnane C., Bryant R. A., Van Ommeren M. (2009). Association of torture and other potentially traumatic events with mental health outcomes among populations exposed to mass conflict and displacement: A systematic review and meta-analysis. JAMA, 302 (5), 537–549. Summerfield D. (1996). L’impact de la guerre et des atrocités sur les populations civiles: principes fondamentaux pour les interventions des ONG et une analyse critique des projets sur le traumatisme psychosocial. ??? : Overseas Development Institute. Summerfield D. (2001). The invention of post-traumatic stress disorder and the social usefulness of a psychiatric category. British Medical Journal, 322 (7278), 95-98. Tankink M., Richters A. (2007). Silence as a coping strategy: The case of refugee women in the Netherlands from South-Sudan who experienced sexual violence in the context of war. In B. Drozdek, J. P. Wilson (Eds. ), Voices of trauma: Treating survivors across cultures (pp. 191-210). New York: Springer. Van Ommeren M., de Jong J. M., Sharma B., Komproe I., Thapa S. B., Cardeña E. (2001). Psychiatric disorders among tortured Bhutanese refugees in Nepal. Archives of General Psychiatry, 58(5), 475-482. doi:10.1001/archpsyc.58.5.475. Ventevogel P., Schinina G., Strang A., Gagliato M., Hansen L. J. (2015). Mental health and psychosocial support for refugees, asylum seekers and migrants on the move in Europe: A multi-agency guidance note. ??? : ???. Wilson J. P., Wilson J. P., Drozdek B. (2004). Broken spirits: The treatment of traumatized asylum seekers, refugees and war and torture victims. New York: Routledge. Womersley G., Kloetzer L. (2018). En Afrique, “aller voir le psychologue,” je n’ai jamais entendu ça »: Médiation culturelle chez les réfugiés victimes de torture en Grèce. Revue Européenne des Migrations Internationales..